G. Loomis NRX Rods are the culmination of everything G. Loomis has been doing in Woodland, WA since day one: building the best rods on the planet — right here in the USA. The innovative NRX rods use a nano-resin binder that makes the rod blank lighter and more powerful than any other G. Loomis rod series. These are the Best Bass Rods Ever Built! Period! Like all G. Loomis rods they come with a Limited Lifetime Warranty. Every rod is Made in the USA. American Legacy carries every G Loomis product made, including all G. Loomis NRX Rods. In Stock. Every rod is eligible for same-day worldwide shipping. 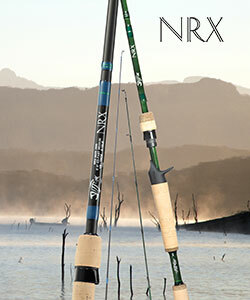 And every G. Loomis NRX rod is eligible for free US shipping. We Sell the World's Greatest Fishing Gear, and Offer Unmatched Personal Service.